Click it and listen. It’s better than stewing over politics. Or politicking over stew. EDIT: This track just came on… and you owe it to yourself to give it a listen. (Tai Shan — Click) You can’t dismiss Rush as a brainless metal band after you hear this. Fake Plastic Drums = Legit Musical Training? 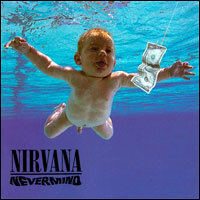 Like many people my age, I can tell you exactly where I was and what I was doing when I first heard Nirvana. It was “Smells Like Teen Spirit.” And that one song singlehandedly was responsible for the next step in my musical and cultural evolution. So much rage. So much energy. So unlike anything I had ever heard before. I was in 9th grade. I went out and bought the single, and listened to it until the tape wore through. My mother got my Walkman (look it up, kids,) heard the song, and officially became deeply concerned for what her little boy was listening to. It was a delicious moment. An article over at NPR music that my wife pointed me to this morning showed me another side of Nirvana’s Nevermind album, pictured above. That was 1991. Seventeen years later, the baby on the cover…? I get the crawls when family looks at my naked baby pictures. This kid? Thank you, Spencer. And here’s to your inner child. Read about this little beauty HERE (click). Then buy me one out of the sheer goodness of your heart, kthxbb. I thought I’d share one of my favorite seasonal resources with my many (LOL) readers: The X-Entertainment Christmas Jukebox. His streaming Christmas jukebox (linked below) contains a collection of holiday favorites from radio and TV of yesteryear, as well as some more obscure tunes (Dominick the Christmas Donkey or Run DMC’s Christmas in Hollis are a couple which spring to mind.) Not all of them are child-friendly, but you are guaranteed to smile and groan as the Christmas memories come crashing through your brain.